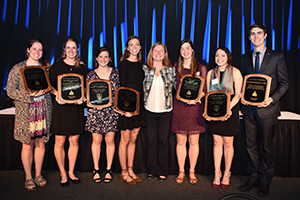 The University of Notre Dame’s Division of Student Affairs recognized seven students at the 31st annual Student Leadership Awards Banquet on April 10. These annual awards honor current students who have made exceptional contributions to the Notre Dame community. The Rev. A. Leonard Collins, C.S.C., Award, honoring a graduating senior who has made substantial personal efforts to advance the interests of students at Notre Dame, was given to Jessica Pedroza of Phoenix, Arizona. As a political science major and AnBryce scholar, Pedroza has served as an advocate and organizer of her peers. Motivated by her drive to promote equality of opportunity for all, she was an original member and leader of the Student Coalition for Immigrant Advocacy, providing education, awareness and advocacy for immigration topics on campus. A first-generation college student, Pedroza also co-founded First Generation ND and served as co-president. Pedroza maintains a deep Catholic faith, which has been instrumental in many aspects of her involvement, but especially in her role as a Senior Anchor Intern in the Office of Campus Ministry. In this position, she organized the Latino First-year Student Retreat to assist in creating a welcoming environment for Latino students. She is also an active volunteer at St. Vincent de Paul, is an ESL tutor for the Community Alliance to Service Hispanics and has participated in numerous service-learning experiences through the Center for Social Concerns. The Rev. Theodore Hesburgh, C.S.C., Award annually honors a graduating senior whose leadership has significantly advanced the climate of welcome and inclusion within or beyond the University community. This year’s recipient is Bryan Ricketts from Cambridge, Ohio. Ricketts, who will graduate from the Reilly Center dual degree program with degrees in political science and chemical engineering, served as both president of the student body and president of PrismND. A committed student leader who cares about the climate for all students, Ricketts has worked tirelessly to make Notre Dame more welcoming and inclusive, developing programming for LGBTQ and ally students and facilitating the Campus Life Council’s work on diversity and inclusion. The John W. Gardner Student Leadership Award, given to a graduating senior who exemplifies the ideals of the University through outstanding community service beyond the University community, was awarded to Alexis Doyle from Los Altos, California. A resident assistant in Ryan Hall and a biological sciences and international peace studies major, Doyle is a Rhodes Scholar whose servant leadership has made an impact on both a local and global level. Identifying a need while volunteering at a clinic in Guatemala, she created a self-sustaining soap cooperative aimed at combating parasitic infections while creating economic opportunity for the women in the area near the clinic. From a local perspective, for the last two years, she has been a fixture at the Sister Maura Brannick, C.S.C., Healthcare Clinic for the Uninsured and now leads student reflections there for 40 undergraduate students. The Blessed Basil Moreau, C.S.C., Leadership Award was awarded to Bridgid Smith from St. Charles, Minnesota. This award is given to a graduating senior who embodies Blessed Father Moreau’s vision of educating heart and mind as well as someone who has demonstrated significant effort in advancing the Catholic character of the University. The Cavanaugh Hall resident and theology and Italian Studies major is a faith-filled, compassionate leader. Her contributions to spiritual life on campus can be seen in her work in the hall as well as Campus Ministry. As a Senior Anchor Intern, Smith helped to establish EXALT Evening Adoration and grow it into an opportunity for students to pray before the Blessed Sacrament on Friday nights. Her creativity in developing new initiatives further enhances the faith lives of students and has allowed her to serve both the Cavanaugh and the broader Notre Dame communities. Catherine Wagner, from St. Louis, Missouri, was awarded the Ray Siegfried Award for Leadership Excellence, presented to a graduating senior who exemplifies the qualities for which former Notre Dame Trustee Ray Siegfried was known, including leadership, generosity, devotion to the Catholic faith and affinity for athletics. A Pasquerilla East Hall resident, Wagner’s rigorous academic path as a biology major and participant in the Glynn Family Honors Program has worked in tandem with her passion for work in Campus Ministry and her dedication to the Notre Dame Women’s Rowing team. Wagner’s formal leadership role in Campus Ministry began when she was part of the first class of Anchor leaders, where her participation in large and small group discussions assisted her peers in their exploration of faith and allowed her to grow and reflect on her own spiritual journey. In her time at Notre Dame, Wagner also served as a member of the Student Athlete Advisory Council and has participated in the Rosenthal Leadership Academy. Elaine Schmidt from Prairie Village, Kansas, was awarded the Mike Russo Spirit Award, honoring an outstanding undergraduate student who exemplifies the qualities for which Mike Russo was known, including service, personal character and striving to bring the best out of themselves and others. Schmidt, a Program of Liberal Studies major and Latino studies minor, is committed to creating an environment where all feel welcome and supported. She is a resident assistant in Lewis Hall where she has also served as a Welcome Weekend captain, welcoming and mentoring both current and incoming students. As the co-founder of KiND, Schmidt has also embowered her peers to spread random acts of kindness around campus and within the local community. The Denny Moore Award for Excellence in Journalism was presented to Cassidy McDonald, from Madison, Wisconsin. This award is given to a graduating senior who exemplify the qualities of Moore, a former Notre Dame associate vice president, who was known for his integrity, character, commitment to Notre Dame and writing ability. McDonald, a marketing major with a minor in the John W. Gallivan Program in Journalism, Ethics and Democracy, is the editor-in-chief of Scholastic, where she directed in-depth coverage of the campus impact of the presidential election and other topics of importance to Notre Dame. Also noteworthy was her selection by New York Times columnist Nicholas Kristof in a contest to travel with him on a reporting assignment to Tulsa and rural Arkansas. She has been awarded a Luce Scholarship that will provide her the opportunity to report from China next year. Originally published by Kate Morgan at news.nd.edu on May 02, 2017.